When a person is injured in a slip and fall accident, the injury claim is handled under premises liability law. This is because property owners are responsible for providing safe and secure premises for occupants and visitors. The good guys from the Law Offices of Gary Bruce can ensure your slip and fall accident claim is given the personalized attention it deserves. We seek fair compensation for your injuries, medical bills, lost wages, pain and suffering and other losses. Were you injured in a slip and fall or trip and fall accident? Our firm offers complimentary in-office case evaluations to discuss your injuries. In this meeting, an attorney will evaluate your case and advise you on moving forward. Schedule your free initial consultation by calling 706-596-1446 today. Our attorneys have significant knowledge of the responsibilities of property owners. Landlords, property managers, store managers and others have a duty to provide safe premises. These safety measures include making timely repairs to walking surfaces — such as stairs, sidewalks, carpets and floors — and warning people when dangers exist. Failure to do so can result in serious injuries such as back and spinal cord injuries, head and neck injuries, and accidental death. Through negotiated settlements and litigation, our firm seeks recovery for damages. We are dedicated to obtaining fair compensation on behalf of our injured clients for medical bills, lost wages, pain and suffering and other losses. Our firm has the resources that are necessary to secure compensation for slip & fall injuries. We frequently obtain video from stores, gather witness statements, and take other measures to establish liability of property owners. These injuries can diminish your quality of life, may require surgery or lengthy stays in the hospital, and could even result in long-term disability. If you cannot work due to your injury, the hospital bills and lost wages can add up to a bleak picture, especially if you were the primary source of income for your family. Here at the Law Offices of Gary Bruce, we are committed to helping slip and fall accident victims get back on their feet with the compensation they need and deserve. In rare cases, people have even died from a bad fall. If your loved one was killed because of negligence or poor maintenance on the part of a property owner, contact us about a potential wrongful death lawsuit. Slip & fall accidents are common – particularly for older people in high traffic areas. In this kind of accident, just as the name implies, the injury is the result of a slip on a surface that results in a fall or jerk.If you are injured in such an incident, the first step should be to get medical attention. After the injuries have been assessed, you can decide whether your injury should be discussed with a lawyer. We are happy to discuss your case and help you with decisions relating to how to proceed. There is no obligation and the consultation is free. In our experience, the sooner you talk to a lawyer the better, because the technology now available may allow us to capture the data or video of the incident. At the Law Offices of Gary Bruce, we strongly believe that even if we are not able to obtain video immediately, we can make efforts to ensure the responsible party secures and protects the evidence so that it is not lost. Time is of the essence! What are the factors that impact the value of a case? What do I need to prove to bring a case? If you think you have a case, you should consult a lawyer to discuss the matter and preserve all of the evidence as soon as possible. You should gather names of witnesses and take photographs if you can. Notice of the problem is the most important issue in a fall down case – did the owner of the property know of the problem and fail to clear or warn of the hazard? If those facts can be proven, then it can be argued that the owners of the premises has responsibility for the accident because he or she was negligent, or did not take ordinary care, to keep the premises safe. Should I Talk to an Insurance Company? The insurance company for the owner will probably ask you to give a recorded statement outlining what happened. We like to be involved in giving such statements since giving that statement to a trained adjuster to illicit harmful responses can be a problem later in a case. If you have been injured and are seeking medical care, make sure to contact our office as soon as possible. The statute of limitations, or amount of time that you have to file a personal injury lawsuit, in Georgia is only two years; but more importantly, evidence can be lost and problems can develop when too much time elapses. We are happy to meet, face to face, for a no obligation and free consultation to discuss your case. 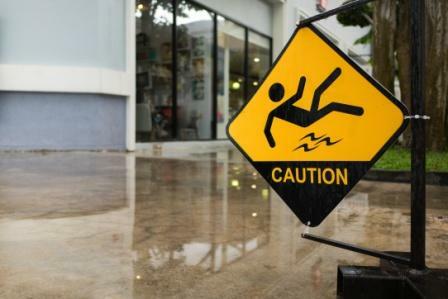 It is vital to have a lawyer experienced in slip and fall cases on your side. Medical debt is the leading cause of bankruptcy in America, and we are dedicated to helping our clients receive the compensation they need in order to move on with their lives and focus on healing, instead of worrying about trying to dig themselves out of massive debt. You might not need a lawyer if your injuries were minor and you didn’t need any medical care for them. If your pride was the only thing hurt in your fall, you don’t need us. However, if your injuries required extensive medical treatment, we strongly recommend contacting us for your complimentary consultation. We don’t charge for consultations, so you have nothing to lose and everything to gain. Even if you think your injuries were your own fault, it can’t hurt to give us a call. Often, people think that their injuries were their own fault, when in fact there were extenuating circumstances that might warrant a lawsuit. Have questions regarding a slip and fall injury? Call the Law Offices of Gary Bruce today at 706-685-6969 for your complimentary, no-obligation consultation. We work on contingency, meaning that you won’t owe us a penny until we make a recovery for you. We serve clients in Columbus, Fort Benning and other nearby areas of Georgia. Our firm also serves clients in Alabama, including the Phenix City area.